LASIK eye surgery is the most popular refractive laser eye surgery. LASIK involves the use of a laser to change the shape of the eye to correct refractive errors such as nearsightedness, farsightedness and astigmatism. LASIK is a permanent vision correction procedure since it is a type of surgery which is not reversible. Thanks to advanced technology, LASIK provides an excellent safety profile and results when performed by experienced LASIK Surgeons for carefully selected patients. LASIK is not right for everyone and requires careful evaluation and consultation.Today more people are routinely electing to have LASIK to correct their vision as it is a suitable substitute for eyeglasses and lenses for most common vision problems. LASIK is a quick eye surgery procedure that provides good vision with few postoperative complications for most people. LASIK is not suited for everyone including people with certain health problems, eye diseases, and other situations that an eye care professional can help to explain in detail as part of your consultation. The LASIK eye surgery process requires that a series of careful measurements be taken to be sure that you are a good candidate. This process should begin with a discussion regarding what your expectations are and what you wish to achieve by being less dependent or eliminating eyeglasses or contact lenses. Then a careful review of you health and eye history should be taken by the doctor’s office. Next, in order to determine the exact prescription that will need to be treated, a refraction should be performed to measure the amount of nearsightedness or farsightedness and astigmatism. This will require the use of eye drops to get the best possible measurements. It will be necessary to map the surface of the eye, called the cornea, with a corneal topographer that gives the doctor a blueprint of the shape of your eye. An important step is to measure the corneal thickness, called pachymetry, in order to help determine whether the anatomy of your corneal is appropriate for LASIK or perhaps another laser eye surgery procedure. Once all of these steps have been completed, the doctor will examine the health of the retina and inside structures of your eyes as a final check. On your day of surgery, a technician will clean the area around your eyes with a hygienic but gentle cleansing pad. The technician will place a series of drops into your eyes in order to get them ready for your treatment. Some of these drops, antibiotic drops, will prevent germs from entering your eye and therefore help to prevent any possibility of infection. Other drops will be placed in your eyes to lightly numb the cornea so that you are comfortable during your treatment. After you recline on the bed-like chair under the laser, an eyelid holder called a speculum, is gently placed between your eyelids to remind you not to blink. Next the LASIK surgeon will use an instrument called a microkeratome to create a very thin, circular layer, called a flap on the front of the cornea. Since you have had numbing drops placed in your eyes, this will not be uncomfortable, but will feel like a slight pressure around your eyes. The surgeon will instruct you to look at a small light during your procedure. Don’t worry if you cannot stay perfectly steady-just do your best. Today’s laser technology uses a tracking system which will actually follow your eye movements if you can hold pretty still during your procedure. 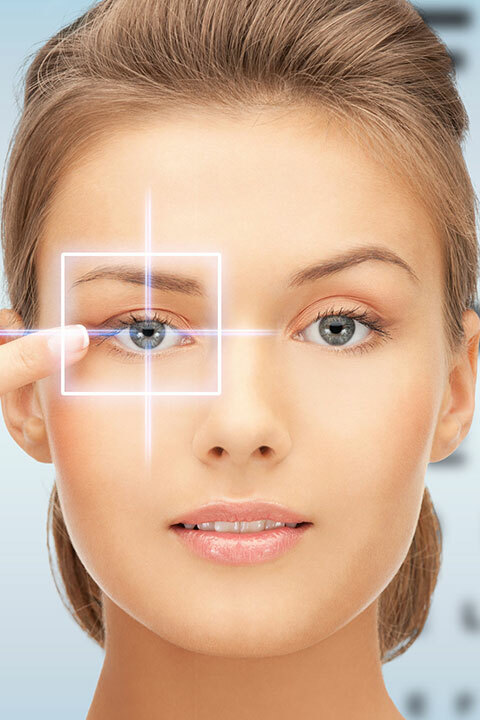 To correct nearsightedness, farsightedness or astigmatism, your surgeon will use an Excimer laser. The Excimer laser is programmed based on calculations made from the measurements taken during your consultation. The laser then delivers the exact correctionÂ needed and send tiny spots of light beams to certain predetermined positions on your cornea in order to change the shape to what is required for you to see well. The eye surgeon has full control of the laser and monitors the position of the laser on the cornea as well as the tracking system monitoring the position of your eye in order to make sure the beam is in the correct place. The creation of the flap and the application of the laser usually takes 5-7 minutes per eye depending on the complexity of the of correction that you need. Finally, the flap is replaced in its original position and because it has extraordinary bonding properties,it acts like Velcro to just stick right back down in place without the need for sutures. The technician will often place additional eye drops in your eyes as the procedure is finished just to give you some added comfort and protection and to help your eyes heal quickly. Most often a protective clear plastic shield will be applied-like safety glasses-to prevent you from rubbing your eyes or in case you get bumped accidentally. Pay careful attention to the detailed instructions your doctor gives you regarding additional drops to use at home and when to return for your first visit. You will need someone to drive you home. To be most comfortable, you should go home and take a long nap. When you awaken you will notice several things. First you will notice a dramatic improvement in your vision. It will most likely not be as good as it will get in a few days as your eyes will need to continue to heal. You should expect to feel some mild “grittiness” or like a little sand or dust has gotten into your eyes for up to a day or so. This is normal. As your eyes heal it is normal and expected to be a little sensitive to light and perhaps see some glare or even haloes around lights at night. This too will diminish as your eyes heal. The best candidates for LASIK Eye Surgery are people with healthy eyes have not had previous eye surgery and are looking to correct myopia, hyperopia, or astigmatism. They must also have stable vision for at least a year. People with medical conditions and taking certain medication may not be eligible for LASIK eye surgery. Also some people with thin corneas may best be suited for other laser surgeries. Wavefront technology is major advance in LASIK laser eye surgery, especially for people who have complicated prescriptions. It may sound a bit funny, but your eyes are like your feet. Shoes usually just come in sizes that measure how long the feet are. With normal LASIK surgery, vision correction is measured by the visual acuity of a person, 20/20, 20/40, 20/100 and how it is altered by the refraction of their eye. This method corrects how much a person can see but not the details of everything else. Imagine if shoes were made exactly for your feet by measuring how wide, how long, comfort level, arch, and so on. The result would be a great pair of shoes that fit perfectly. Wavefront technology does this for the eyes by measuring the whole eye and providing a three-dimensional corneal map. All abnormalities and irregularities, called optical aberrations, from front to back are present in this map and allow the eye surgeon to correct your vision to a “perfect fit”. This allows correction for not only nearsightedness or farsightedness and astigmatism and its impact on visual acuity, but also for other aberrations that can affect contrast sensitivity, night vision, depth perception, and light sensitivity. By correcting all these factors, each individual’s vision can be improved dramatically by correcting for the individual’s specific problems.